With former band Black Sabbath riding high, after Ozzy’s departure with two successful studio albums and one thrilling live album, Ozzy Osbourne was not about to disappear in a puff of smoke. He let the world he was still around and still able to rock with his second album, “Diary of a Madman.” In fact, when people talk about this album today, it is often in the same breath as his fantastic debut album, “Blizzard of Oz.” Many go on to boldly declare that these are his two best albums ever! Even though I’m inclined to agree, I won’t enter into that debate but what I do know is that “Diary of a Madman” made my 1982 that much nicer. What I find so great about this album is that every song has something to like about it. 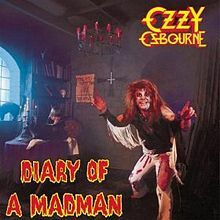 As much as this has been stated about so many albums, there literally is no song to dislike on “Diary of a Madman.” Hell, there isn’t even a mediocre song on it. “Over the Mountain” lets you know that this is going to be a great album, so prepare for the ride. “Flying High Again” gave me that “I remember that song and it was cool” feeling and brought back memories to when I used to rock to it back in the day. “You Can’t Kill Rock and Roll” could have and should have been used a statement against the anti- rock movement that would manifest itself a couple of years down the line. Oh, I’ll go into that much more when the time comes. “Believer,” “Little Dolls” and “S.A.T.O.” all show what a great guitarist Rhoads was although he works his six string magic all over the album. “Tonight” is the token ballad and it is done very well and with the title cut closing out things, the result is one brilliant album from Ozzy. His first two solo albums alone are plenty of reason why he should be knighted. Like Black Sabbath with “Live Evil,” Ozzy’s band would have similar problems during the recording of “Diary of a Madman.” Bassist Bob Daisley and drummer Lee Kerslake would be fired from the band when they approached management about not being paid. 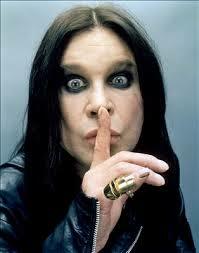 From what I’ve heard and read, that may have been down to new manager, Ozzy’s wife Sharon, stamping her authority. However, the biggest blow would be the loss of guitarist Rhoads and that is something that I feel needs its own post. But whatever went on behind the scenes, this album is a sure fire cracker. 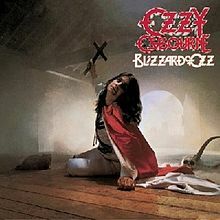 “Heaven and Hell” proved for Black Sabbath that there was life after Ozzy, however, in 1981, Ozzy’s debut solo album “Blizzard of Oz” proved for him there was life after Sabbath. Since his departure from the band in 1978, the Oz had been battling with booze and drugs but he managed to clean himself up enough to put out an album that would forever be a major rock in the foundation of heavy metal. “Blizzard of Oz” changed the way many people, me too, at the time thought about hard rock music. It was in this year that I acknowledged heavy metal as its own genre of rock music and this album was one of the reasons why. There is preciously very little about “Blizzard of Oz” that I could say that hasn’t been already said. The only thing I can do is to share how it has influenced me over the many years and I still worry if I will be able to do it justice. What I like most about it is the fact that Ozzy didn’t go out and recreate an album that sounded like his former band. His brand of metal here is totally unique but you still know that it is Ozzy at the mike. That comes through clearly with the opener “I Don’t Know,” a good opening song as any. It leads the listener onto to want to listen to the rest of the album while letting you know, (if this was 1981), that Ozzy was back. But there are so many great classic songs on the album that are still popular among metalheads today. “Suicide Solution,” “Mr Crowley” and the single “Crazy Train” will forever go down in the annals of metal history as classic all time great metal songs. Even the ballads “Goodbye to Romance” and the powerful “Mother Earth” play their part in making “Blizzard of Oz” the iconic album that is still is. I don’t want to take anything away from the great Ozzy here because his vocals on here can’t be duplicated and prove his abilities. Still, what catapults this album from being good to being great is the guitar work from the late Randy Rhodes. He is considered one of the greatest guitarists of all time and he definitely shows why on “Blizzard of Oz.” The solo on “Crazy Train” is one of my favourite and what he does on the other tracks is completely out of this world. So the math teacher in me concludes that Ozzy+ Randy = some memorable heavy metal.